University of Wyoming McNair Scholar Audrey Plenty Hoops presented her research at the recent Heartland Research Conference. 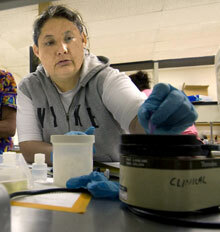 Audrey Plenty Hoops of Crow Agency, Mont., a senior in plant sciences, discussed "Identification and Characterization of Escherichia coli in Natural Water Ways on the Crow Indian Reservation Using Molecular Methods" during the recent Heartland Research Conference. Her work was directed by Anne Sylvester of the Department of Molecular Biology and John Willford of the departments of Microbiology and Molecular Biology. For more information, call the McNair Scholars program office at (307) 766-6189, TTY-(307) 766-3073,e-mail mcnair@uwyo.edu or visit the Web site at www.uwyo.edu/SEO/mcnair.